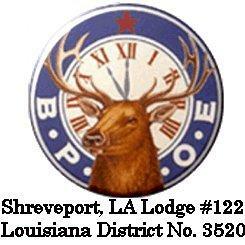 We are Elks Lodge #122, Shreveport, LA. Our RV Park Now Has 50 amp Service, Water and Sewer Service For All 6 RV Sites. Rental is $20 a Night, To Reserve a Spot Requires a Payment for 2 Nights. Please Call The Office at 1-318-868-5301 For Reservations. Hours of Operation Sunday to Thursday 11:00 a.m. Till 11:00 p.m.
Friday & Saturday 11:00 a.m. Till 12:00 a.m.